In order to cultivate children’s 5 major abilities, all courses are carefully designed according to the order of how humans acquire knowledge. The 5 major abilities include hand ability, spatial ability, shape ability, mathematical skill, and literacy. 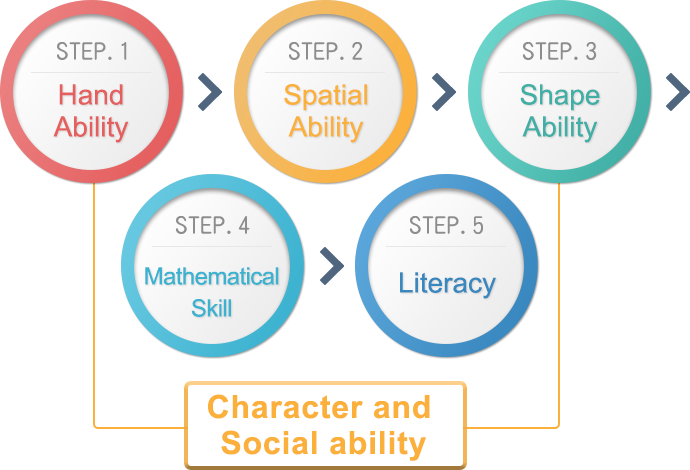 After the 5 abilities are fully developed, children will have good character and social ability. We provide lessons that aims to build each of the 5 abilities. Children will be able to understand the things around them by using the 5 abilities. Children will enjoy the process of learning once they are equipped with the 2 abilities above. What we’re doing is not forcing children to learn, but rather encouraging them to experience, and to think on their own. Our ultimate goal is to let children able to solve any knid of problems without the help of others. Parents can learn together with children by following the curriculum. The instruction videos of each lesson have high image quality. Members are able to watch the content of the videos via electronic devices such as computer, personal computer, smartphone, and tablet without being subjected to time and place. This allows children a more flexible learning environment. Since online learning allows children to learn without the boundaries of time and place, children and parents can enjoy the lesson at home, which provides an opportunity for parents to spend time with children. The relationship between a parent and a child is among the most significant in a person’s life. Thus it would be great if parents can give suggestions and discuss the problems with children after watching the instruction videos. By doing so, it will promote children’s learning efficiency and outcomes while at the same time improve parent-child relationship.